Brain scans of people with autism reveal many things — structures that are unusually large or small, or atypical patterns of activity. But increasing evidence suggests that autism begins well before birth. By the time a person is diagnosed, her brain may have already adjusted to compensate for the condition. To glimpse what the brain looks like as autism takes root, scientists have sought to scan children as young as toddlers and, more recently, babies. At least two different teams are reaching back even further, scanning fetuses with a family history of autism. Both projects are just getting underway, but experts say they eagerly anticipate the results. The concept of scanning fetal brains is not new. Doctors routinely track brain development during pregnancy using ultrasound, which provides a crude view of the brain’s structure. If they see signs of atypical development — an unusually shaped structure in the brain, for instance — magnetic resonance imaging (MRI) can give a more detailed look. Fast, sophisticated MRI scanners require only about 20 seconds to capture snapshots of fetal brain structure. The interest in early brain development in autism arises from brain scans of younger siblings of children with autism. These ‘baby sibs’ are at increased risk of having the condition themselves. Certain areas of the brain grow faster than usual in 6- to 12-month-old baby sibs who go on to have autism than they do in controls, a study in February reported. Another study in March revealed that 6-month-olds later diagnosed with the condition have excess fluid between the brain and skull. Fetal folding: Brain scans of fetuses reveal when the brain’s outer layer acquires its characteristic folds. Baby sibs with autism also have unusual patterns of brain activity as early as 6 months of age. Researchers say analyzing activity patterns is likely to be more informative than looking at structure alone. “It’s about the way the brain regions are communicating with each other,” says Moriah Thomason, assistant professor of pediatrics at Wayne State University in Detroit, Michigan. Until a decade ago, it seemed technologically impossible to examine brain activity before birth. That’s because it can take about 10 minutes to perform functional magnetic resonance imaging (fMRI), which tracks blood flow as a proxy for neuronal activity. 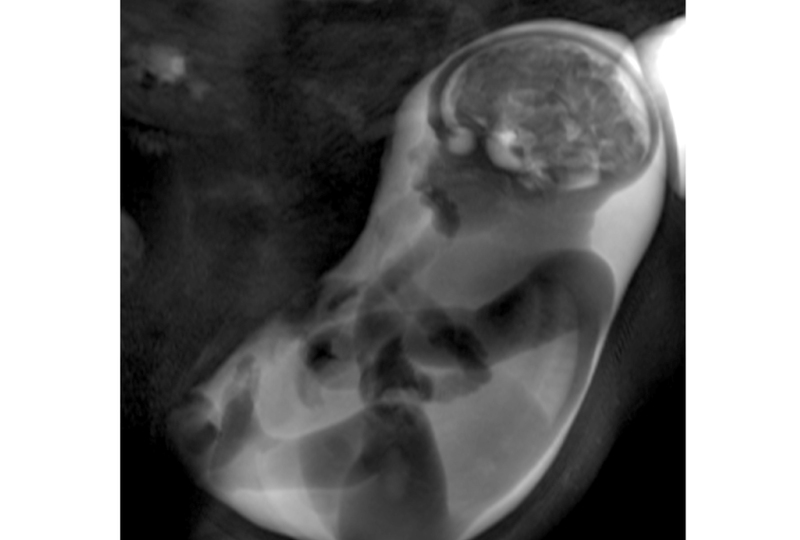 During this time, a fetus can wiggle around, blurring some of the images. Even a mother’s breathing or digestive processes can jostle her fetus. But this approach is too expensive and cumbersome, says Colin Studholme, professor of pediatrics and bioengineering at the University of Washington in Seattle. He and others are developing a different workaround: mathematical algorithms to detect and correct artifacts in brain scans that result from fetal movements. In November, Studholme’s team reported an algorithm that minimizes distortion in images taken from adults told to move their heads while in the scanner. Applying the algorithm to scans of eight fetuses improved the clarity of the scans1. “Fetal imaging has a great potential to offer unprecedented information,” says Hao Huang, associate professor of radiology at the University of Pennsylvania in Philadelphia. Huang also devises motion-correction algorithms but was not involved in Studholme’s study. “But further technology advances and validation are needed before information from fetal imaging can be fully trustable,” Huang says. In order to spot changes in children with autism, researchers need an atlas of typical brain development. The Developing Human Connectome Project aims to create this reference work. A consortium of researchers at three institutions are scanning the brains of 1,500 fetuses and babies between 20 and 44 weeks after conception, within two weeks after the birth or, whenever possible, both. The team uses fMRI to collect data on brain activity. The researchers also use a technique called diffusion tensor imaging (DTI) to probe the structure of nerve bundles that link brain regions. They plan to get enough data points from fetuses of various ages to map how neural wiring and activity in the fetal brain change over time. They have scanned more than 600 fetuses so far. Murphy’s baby sibs study is part of the project. He and his team have so far scanned the brains of 24 baby sibs. Preliminary evidence hints that the sibs have atypical brain activity shortly after birth, but the researchers haven’t finished analyzing the fetal scans. In particular, brain regions involved in processing sensory stimuli such as sights, sounds and touch appear to be more active in baby sibs than in controls. If confirmed, these findings could help to explain why some baby sibs have trouble integrating information from different sensory modalities at 9 months of age. “The earlier we can look at the brain, the more answers we get in terms of the causal mechanisms that are at play” in autism, says Gráinne McAlonan, deputy head of forensic and neurodevelopmental science at King’s College London. McAlonan presented the unpublished findings at the 2017 International Meeting for Autism Research in May. Another project, led by Simon Baron-Cohen at Cambridge University, is recruiting pregnant women with autism. The goal is to use MRI, fMRI and DTI to scan the brains of their fetuses during the third trimester of pregnancy, and again within three months after birth. The researchers plan to follow the children’s behaviors as they grow, and assess them for autism when they are 2 years old. “We can look to see whether the brain data predicts later behavioral data,” Baron-Cohen says. Twitching twins: Babies move frequently in the womb, making it difficult for researchers to analyze their brain activity. The researchers all caution that the aim of these projects is not to diagnose autism or to help parents make decisions about whether to continue a pregnancy. Even if they could use brain scans to diagnose the condition in utero, it would be impractical to put every pregnant woman into a scanner. Rather, the goal is to understand which brain regions and structural changes contribute to autism. Fetal brain scans have already been deployed to find markers for other conditions, such as congenital heart disease, which can deprive the developing brain of oxygen. Some children with congenital heart disease develop learning difficulties, hyperactivity and mood problems by the time they enter school. Researchers are using fetal fMRI to identify the brain changes that predict these difficulties. “We can begin to identify problems early enough so that we can intervene,” says lead investigator Catherine Limperopoulos, director of the Developing Brain Research Laboratory at Children’s National Health System in Washington, D.C.
Baby brains: To examine autism’s origins, scientists are scanning fetuses with a family history of the condition. Moriah Thomason and her colleagues used a similar approach to identify brain features that underlie the language difficulties seen in some preterm babies. 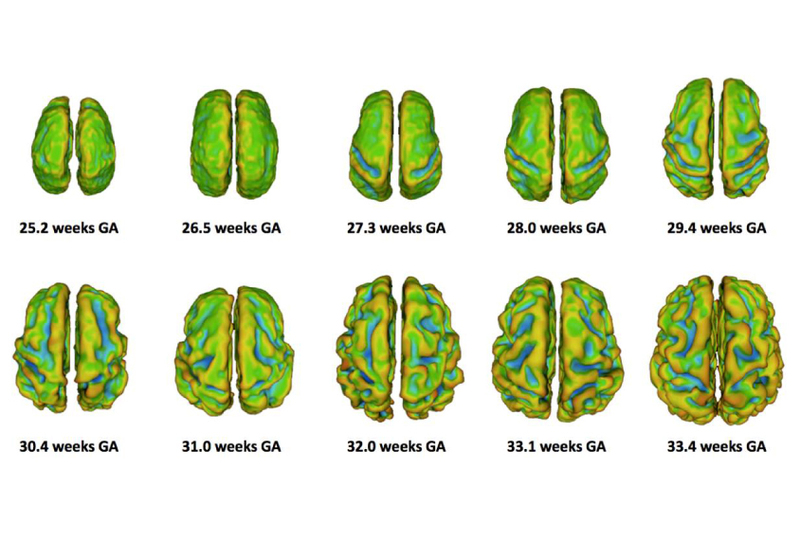 They scanned 32 fetuses, 14 of whom went on to be born prematurely, and found that those born preterm have weakened connections between areas of the brain that specialize in language processing2. They plan to track the children’s language development to see how it might relate to behavior. Murphy says fetal scans might reveal how risk factors for autism shape fetal brain development, and how early brain changes track with later behaviors. His team and Baron-Cohen’s team expect to wrap up their studies next year.